Early 20th-century damaged buildings next to a new loft tower in Mexico City's Colonia Roma. Photo by Francisco Peláez, Wikipedia Commons. Separating cause from effect is notoriously difficult when it comes to gentrification and neighbourhood amenities, including public safety. This column exploits the sudden ending of a rent control regime in Cambridge, MA to examine whether and by how much gentrification affects crime. In the years immediately following the end of rent control, crime fell significantly more in neighbourhoods that had been heavily rent controlled. However, those neighbourhoods also saw the highest turnover in occupants, suggesting that incumbent renters of in these areas were priced out of their properties and thus missed out on the benefits from gentrification. Gentrification raises property values, but is likely to produce both winners and losers. Cambridge’s experience was no exception. We find that rent de-control caused overall crime to fall by 16% – approximately 1,200 reported crimes annually – with the majority of the effect accruing through reduced property crime. This overall reduction in crime created $200 million in economic value for the city of Cambridge. These estimates provide rigorous evidence that improvements in public safety are an important part of the gentrification process. At the same time, they suggest that the process need not benefit all residents. 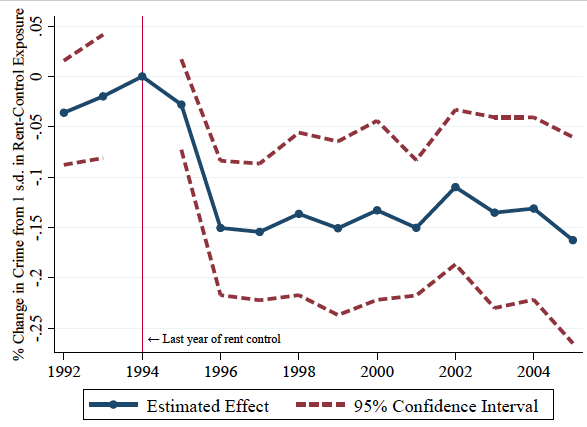 The neighbourhoods that had the most rent control prior to 1995 saw the most turnover after de-control, suggesting that incumbent renters of controlled units were priced out of existing units. It’s likely that many of these residents left Cambridge altogether and moved to less-expensive municipalities. While the ensuing influx of new renters probably increased city tax collections and landlords’ bottom-lines, those displaced by gentrification did not necessarily benefit from improvements in neighbourhood safety and other amenities.